Map of Queensland Reserves and Missions, 1958. Location of Government Settlements, Church Missions and Torres Strait Island Reserves. 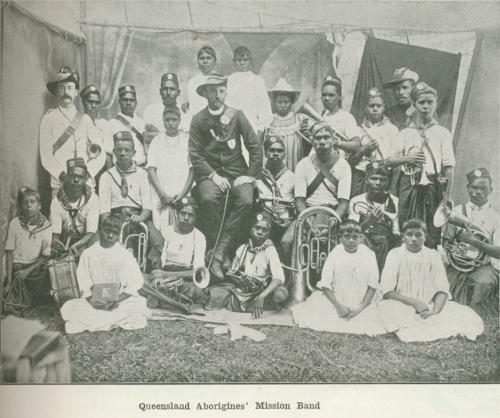 Native Affairs - Annual Report of the Director of Native Affairs for the year ended 30 June 1958, Queensland Parliamentary Papers, Vol 2, 1958–59. Places mapped include Cherbourg Settlement, Woorabinda Settlement, Foleyvale Reserve, Aitkenvale Hostel, Palm Island Settlement, Fantome Island, Yarrabah Mission, Mona Mona Mission, Bloomfield Mission, Hopevale Mission, Lockhart River Mission, Bamaga Settlement, Mapoon Mission, Weipa Mission, Aurukun Mission, Edward River Mission, Doomadgee Mission, Morningington Island, Boigu Island, Dauan Island, Mabuiag Island, Badu Island, Moa Island, Saibai Island, Darnley Island, Yorke Island, Murray Island, Stephen Island, Yam Island, Coconut Island, and Thursday Island.